Social media is commonly used as a platform for marketers to promote their content and products. Millions of businesses use social media to communicate with their customers every day. These conversations are typically one-sided. Business accounts send out tweets but don’t bother responding to their customers. Businesses and individuals need to have more conversations with their audiences. It is conversations that allow the strongest relationships to occur. You don’t get long-lasting friends that matter by having one-sided conversations with them. You need to have a conversation with someone if you want to build a strong relationship with that person. However, the conversations that create friendships are more than the wave, the greeting, and then the departure. Conversations that build strong relationships need to last for a long period of time. In order to continue a conversation with someone on social media that turns into a strong relationship, follow these 10 tips. At the end of many of my conversations, I wish people a wonderful week or weekend depending on the day of the week. I do this for two reasons. The first reason is that I do want these people to enjoy their weeks and weekends. We have the right to enjoy our lives. The second reason is that this ending encourages the conversation to develop. Many of my followers also wish me a wonderful week/weekend depending on the day of the week. Questions are great ways to continue a conversation. After one of my followers wishes me a wonderful week/weekend, I ask that followers what he/she has planned for the week/weekend. Many people respond telling me all of the things they have to do for the week/weekend. I follow up with a list of things I have to do as well. Asking this question allows me to learn what my followers do. If I find a pattern, I may create a product around that pattern. On a simpler scale, you can start a conversation by asking what your followers’ favorite books are. Asking these types of questions to all of your followers will start up multiple conversations. Just because a conversation ends does not mean you and the person you were talking to will never have another conversation together. You can talk to the same person again and again, just like a real-life friendship. One of the best ways to start a conversation is with an act of gratitude. I constantly thank the people who share my content with their audiences. I have thanked the same people multiple times. Many of the people who I thank either say something like, “You’re welcome,” or “Thank you for putting up the content so I could share it.” If you get one of these two responses, you should continue the conversation with that person. Most marketers are so focused on sharing and creating content that they forget to thank the people who appreciate them. Some of the people who share your articles will feel so grateful that you thanked them that these people will continue sharing your content. When you do this, it is important to avoid abusing this power (don’t use this to manipulate your followers), and in the end, your followers will only share your content if it is valuable. Social media posts with pictures have been proven to get more engagement than social media posts without pictures. If you include pictures in more of your posts, you will start more conversations with your followers. Some of the people who engage with your pictures will be people who have had conversations with you in the past. You can continue interacting with these people to strengthen the relationships and interact with other people for the first time to start new relationships. Not every social media user is created equal. Ideally, you want to talk to the people who are interested in the content you share on your social networks. These are the people who would be more likely to share your content and be grateful for your insights. You want to build an audience of like-minded people so that, when the conversations do take place, you are talking to the right people. In addition, when you hop onto a conversation, make sure the people in that conversation are the right people to talk with (like-minded people who share an interest in your niche). You can’t have much of a conversation with someone else unless you respond. The longest conversations that take place are the ones where people quickly respond to each other. Most of these conversations are real human interaction without any technology involved. On social media, you need technology to communicate with your followers. However, you can make those conversations last longer by responding quicker as if you were in a real conversation. I make it a policy to get back to my followers within a day. Depending on when the conversation starts and when I log in, I may get back to some people within a few seconds or close to 24 hours. By responding quicker, your followers will be more likely to remember the conversation when they see your response. Quizzing your followers is a great way to start more conversations. You can quiz your followers by giving them a clue to identify someone, something, or an event such as, “Who was the 33rd President of the United States?” The answer to that question is Harry S. Truman. Of course, some followers may choose to look that up, but you get more interaction. The best quiz questions are the ones that require a guess. Think “How many pieces of candy are in the box” type of questions. You can offer a free prize to the first person who guesses the right answer or is the closest to the right answer. What should my next product be about? In less than a minute, I just created a poll that could be put on any social network, including Twitter with its 140 character limit. This type of poll would allow me to know what products my followers want. Having this knowledge would allow me to make better decisions when I create my future products. You can ask any poll question such as, “Which social network do you like the most…” Not all of them have to be related to your products or expertise. When you contribute to a conversation, you need to thoughtfully contribute to that conversation. In human interaction, we don’t have as much time to think about what we say. We say what we think of. Sometimes, we say thoughtful things while at other times, we say things that we should have thought about before saying. On social media, you have time to think about what you say. Utilize the extra time to think before you post something on social media. Then, you will have a better reply to a conversation that makes the conversation build. 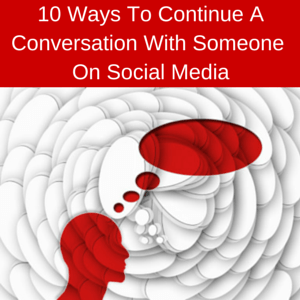 Conversations are important on social media because they allow relationships to build. Some of these relationships may turn into sales, subscribers, and people who promote you for a long time. However, most conversations on social media are either one-sided or do not last for a long period of time. Everything you post is the start of a conversation. It is up to you to post the type of content your followers would be encouraged to engage with. Then it is up to you to keep those conversations going so you can build stronger relationships with your followers. What are your thoughts on having conversations on social media? Do you have any other tips for making a conversation continue for a longer period of time? Please share your thoughts and advice below.